Whether making our food taste better or doing wonders for our health, many of you already know about the many benefits of onions. Onions fascinate me, so for this article I compiled some things you may not know about this magical vegetable. From cooking to health to beauty, I hope you find ways to use onions in many areas of your life. Whenever most of us think of onions, we think of flavorful foods made better by this tasty vegetable. I wanted some cooking tips for this article that we haven’t tried before. “Marinate your onions in salad dressing before you add them to your salad. It’s easy. When you go to make your salad, start by chopping or slicing your onions and then pour a vinegar or citrus-based dressing over them. Let them soak for about 10 or 15 minutes and their heat and flavor will mellow considerably. Then toss them and the dressing into your salad. “1. Cook chopped onions in butter or oil until they’re soft and golden. You can do this along with garlic and peppers as long as everything is chopped about the same size. Do you want natural remedies for what ails you? In this great article from Bustle, Kristin Collins Jackson breaks down two ways onions can improve your appearance. 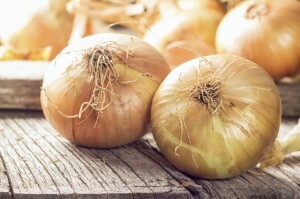 Onions have powerful properties that can help stop hair loss and give you clearer skin. Jackson says you should make your own “skin pack” with raw onion juice, gram flour and yogurt. Onions can also contribute to a great acne face mask, according to Bustle. The ingredients for this evening concoction include: raw onion juice, neem oil and tomato juice. Finally, hair loss. Did you know that onions can help you avoid it? And of course, there are plenty of onions available for purchase at your nearest Ream’s Food Store!